This vintage French demi-corbeille capitone double bed has its original fabric and a studded finish. It is painted in Farrow and Ball all white distressed and finished in a soft wax finish. 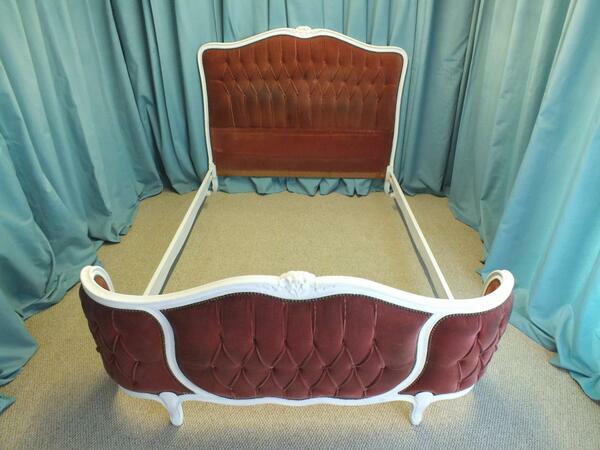 The bed has a wooden frame with a curved footboard. SOLD all the way to South Korea. Antique furniture and other items are very sought after; it can make a beautiful addition to any home no matter what your tastes. Whether you are looking for antique beds, French antique furniture, antique or vintage textiles or even smaller collectable items; all of these items of course can be found in antique shops, but finding these can often be difficult and so the best place to have a good choice of antique goods is at an antique fair! Here at D&P French Interiors we have put together a list of upcoming antique fairs in the UK to help you find any that are near you; you could even fit in some last minute Christmas shopping if needs be! Saturday 21st – Hatfield House in Hertfordshire has an antiques and collectors’ market this Saturday, it is free admission and parking and there is a restaurant on site. In Wetherby, West Yorkshire, Wetherby town hall is having an antique, vintage and collectors fair on Saturday where there will be a range of furniture, books and more; it is free entry and is open between 9.30 and 4.30pm. In Whitstable Kent, St Mary’s Hall will be hosting the Seaside Brocante Fair where there will be a wide selection of antique and vintage items; it will be open from 10am until 4pm and admission is £1. Sunday 22nd – In Mold, North Wales there will be an antiques and collectables fair at Beaufort Park Hotel this Sunday, it will be open from 9am until 4pm and entry is £1. Park Hall Hotel in Chorley, Lancashire has an Antiques and collectables fair on Sunday which will be open from 9.30am til 3.30pm. For years Park Hall has been the venue for world renowned antiques fairs, so this is one not to miss! Thursday 26th – In Lytham St. Annes in Lancashire, the Lowther Pavilion will be hosting an antiques and collectors fair between 9.30am and 4.30pm, admission will be £1. Saturday 28th – Helmsley Town Hall in North Yorkshire is having a fair between 9.30am and 4.30pm. At the Prestwood Centre in Stafford there will be a 2 day antiques and collectables fair where exhibitors will come from all over the UK with a huge selection of goods. The Burgess Hall in St Ives will have over 50 specialist antique dealers at this fair which will cost £2 and will run from 10am until 4pm. At St Mary Magdalene Church Hall, Donegall Pass, Belfast there will be a free antiques and collectable fair that will be open between 10am and 4pm. Sunday 29th – At the Coventry Sports Connexion the Sky Blue Sports Connexion antiques and collectors fair will take place between 9am and 4pm. There will be over 100 stalls, free parking and admission will be £2. At Wilmslow Leisure centre in Cheshire, this antiques fair is a regular event that will be open between 10am and 4.30pm; entrance costs £2. Dunston Hall in Norwich is holding and antiques fair where all items on sale pre date 1940. Admission will be £3 and the fair will run from 10am until 4pm. Berkhamsted Sports Centre in Herts will hold an antiques and collectors fair with over 100 stands between 9.30am and 4pm. Millenium House Pensilva in Nr Liskeard, Cornwall will hold an antiques fair with up to 70 stands full of a wide range of antique goods; open from 10am until 4pm and admission is 50p. Monday 30th and Tuesday 31st – Helmsley Town Hall in Helmsley, North Yorkshire will be holding another antiques, vintage and collectors fair over these 2 days, between 9.30am and 4.30pm. Our stunning range of antique French bedroom furniture has all been carefully selected and comprises of beautifully crafted pieces that exude elegance, romance and quality. Bring the sophistication of French style into your bedroom with a delicately carved rococo bed, an ornate armoire, or a unique bedside table. The beauty of French antique furniture is its ability to effortlessly sit alongside a spectrum of styles and tastes. Whether you want to create an opulent and palatial boudoir, or channel the relaxed elegance of a country chateau, our French antique bedroom furniture is ideal. Our Rococo style antique double bed has the versatility to inspire a range of interior design styles. With its soft wax finish in Farrow and Ball lime white and gentle hand carved curves, this impressive piece will work with pretty florals for rustic charm, as well as with luxurious detailing for opulent glamour. Dating from around the 1900s, this genuine French antique piece can be painted to suit your exact requirements, should it not fit with your current colour scheme. Your bedroom can become a haven of tranquil grandeur with this truly stunning rococo style antique double bed. The French antique 2 door Louis XV style armoire features mirrored doors, gentle curves and a lightly distressed soft wax finish. Its beautifully carved detailing creates a striking yet elegant piece of antique furniture that exudes sophistication and French style. Ideal for the romantic charm of a country retreat, this wardrobe has been painted in Farrow and Ball lime white, and could equally create the more opulent atmosphere of a city boudoir depending on the furniture it is paired with and alternative choice of finish. Combine practical storage with a touch of 18th century regality with this stunning armoire. Evoking the opulence of the Classical French style, this Henri II style antique bedside table features a unique marble top and ornate hand carved detailing. Painted in Farrow and Ball lime white, this piece has a single drawer at the top with a larger storage compartment beneath, and can of course be custom finished to suit individual style requirements. Browse through our website to see our entire collection antique and vintage French furniture, or for more information about any of these fine pieces of French bedroom furniture, please don’t hesitate to contact us. Traditional French furniture takes inspiration from a variety of sources. It can comprise of classical pieces of refined elegance taking inspiration from the late 17th century and the opulent bourgeoisie. Alternatively, items can reflect a more rural lifestyle, echoing the rustic charms of provincial French châteaus. Classical French furniture, traditionally intended for the aristocracy, is associated with Baroque, Renaissance and Rococo styles. Elaborate carving, ornate detailing, gilt work and veneers of tortoiseshell and ivory combine to create an air of palatial sophistication. Provencal French furniture is characterised by its emphasis on simple carving, cabriole legs, wheat patterns reflecting rural surroundings, and lightly distressed finishes. French elegance is captured in a more relaxed fashion, as romance and rustic charm is encapsulated in each piece of furniture. Each piece of our authentic antique and vintage furniture will bring the magnificence of French style into your home. Our extensive range of original pieces include upholstered Rococo chairs, sideboards, gilt mirrors, armoires, bedsteads and dining sets. Whether you want to make a bold and opulent statement of French Regal style in your dining room or prefer to create a more romantic and refined feel for a bedroom we will have the furnishings for you. Our bespoke painting service is available if you are working with a colour scheme, where the experts at D & P French Interiors will lovingly carry out alterations using only the highest quality paints. Alternatively, if you have something specific in mind we will happily source French furniture to suit your requirements. We are passionate about sourcing the finest selection of antique and vintage French furniture. From rustic simplicity to rococo embellishment, D & P French Interiors have a selection of furniture that encapsulates the beauty of French style and sophistication. When it comes to redecorating any room in the house, choosing the furniture can often be one of the trickiest processes, trying to make sure that everything looks good together can seem like a mammoth task, but it needn’t be! Of course it is important to take your time redecorating to make sure that you are completely happy with the end result; by taking your time you can ensure that you get the chance to think carefully about what style and colour you are going to go for, it also means that you can spend plenty of time looking at all your different options and choosing what’s right for you. Once you have your colour scheme chosen you can then go about selecting your furniture, one of the reasons why this can seem so difficult is because there is simply too much choice. Some people prefer traditional while others prefer modern, some prefer dark woods while others prefer light woods, whatever you prefer there is no shortage of amazing furniture for you to choose from! If you are at the furniture choosing stage and are struggling let me offer you one piece of advice: you can’t go wrong with French antique furniture! Don’t be fooled into thinking that antique furniture is old fashioned and lacks style because this simply is not the case, French furniture can turn any room into a unique and stylish masterpiece. French antique furniture has the ability to add elegance to any room and can add decoration without being overly bold; this subtlety is what makes this style of furniture perfect for so many rooms because it will always look great. This is proved by its popularity; so many people love French antique furniture and if you aren’t already one of those people you soon will be. Of course it would be wrong to say that French furniture is ideal for everyone, but if you like style, elegance and combining the old with the new, and then it certainly is the perfect option for you!